Braun BNC004BKBK Black Analog Quartz Alarm Clock. Quiet German precision quartz movement; Voice activated snooze function; Crescendo alarm; 65mm. 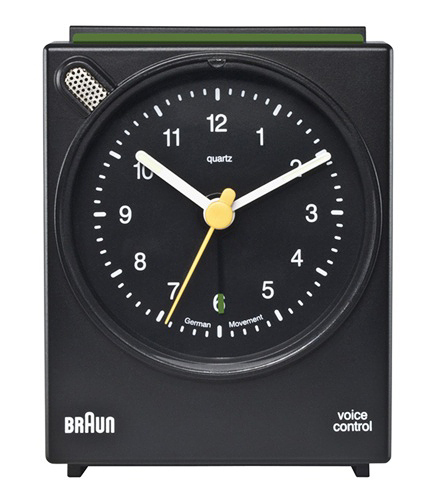 Braun alarm clock with voice control in black (formerly known as the Braun AB30 alarm clock). A practical modern design icon for everyday use! This iconic travel alarm clock was originally designed in 1990. This practical Braun alarm clock is the perfect travel alarm clock since it stands only 3" tall, compact enough to take anywhere. While primarily used as a travel clock, this clock also works very nicely on the desk. The Braun travel alarm clock features a practical voice control function; simply clap or use your voice and the snooze function is activated. The alarm will repeat after some time has passed until it is turned off. This alarm clock has a large pop up switch with green stripe. It also features a clear crisp crescendo alarm signal and a quiet quartz mechanism with silent German movement. It has an easy to read minimalist dial layout, inherent to the Dieter Rams motto "less and more". Like most of the world's best timepieces the BNC002 operates in the analog domain with a sweep second hand. No need to worry about a ticking sound either, this Braun alarm clock features a silent German precision movement. One AA battery will last over one year (included). A pared down, very small but reliable alarm clock, it has a voice or clap activated snooze function. Braun was one of the world's most commercially successful design firms in the post-war years through to the end of the 1980's. Born out of a garage in 1921, Braun made radio parts and diversified using rapidly developing technology. With an impressive design team including Dieter Rams (German, born 1932) and Dietrich Lubs (German, born 1938), Braun's reputation as a maker of innovative small appliances sky-rocketed: electric shavers, hair dryers, travel alarm clocks, digital watches, pocket calculators, stereo equipment.